I’ve been preparing looms for the photo shoot for our new catalog. Since I have a lot of weaving to do, I’ve been trying to speed things up. Here’s how I’m weaving on the Schacht School Loom. 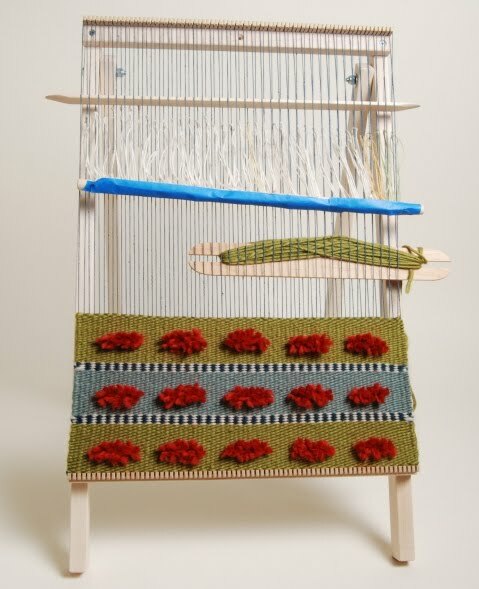 The Schacht School Loom comes with two heddle bars and a weaving needle (for when you reach the top and can’t use the pick-up stick to make a shed). Normally to weave, you leave one pick-up stick in at all times and take out the second pick-up stick after each pick. Since it takes a bit of time to pick-up the second shed each time, I sped up the weaving by using some string heddles that I had made for my inkle loom. I folded them over every other warp thread and placed them on a heddle rod. To prevent the heddle rod from falling out, I taped the string heddles onto the heddle bar with non-sticky painter’s tape. I also used a 12″ stick shuttle for each of my weft colors, and a tapestry beater beat the weft into place. To weave, then, I inserted one pick-up stick which stayed permanently installed, and made the opposite shed with the heddle bar. To make the shed, I simple pulled up on the heddle bar and slid the second pick-up stick into place. When finished with that pick, I simply removed the pick-up stick and made the next shed with the pick-up stick already in place. The little orange puffs are rya knots.